A sky_base material is used for the sky objects. Enables a cube map texturing of the sky sphere. This option allows using static sky images, for example, to create a night sky with stars. None - a background texture is not used. Single - one background texture is used. Double - two background textures are used. Specifies if the procedural clouds will be rendered. The following textures create textured sky sphere clouds and are modified in the Clouds section of the Textures tab. Mask for the 1st upper cloud layer. The texture is 4-channelled (RGBA). Mask for the 2nd lower cloud layer. The texture is 4-channelled (RGBA). Noise texture for the 1st upper cloud layer. The texture is 4-channelled (RGBA). Noise texture for the 2nd lower cloud layer. The texture is 4-channelled (RGBA). For the first layer, two texture transformations (Clouds 0 and Clouds 1) are summed. Mask 0 is multiplied by the Threshold 01, modulating the strength of masking. The mask is subtracted from the textures transformation sum. The color intensity of the resulting Clouds 01 layer is computed by multiplying it by the Clouds 01 parameter value. For the second layer, two texture transformations (Clouds 2 and Clouds 3) are summed. Mask 1 is multiplied by the Threshold 23, modulating the strength of masking. The color intensity of the resulting Clouds 23 layer is computed by multiplying it by the Clouds 23 parameter value. The rendered clouds are adjusted by the Sphere value that controls the influence of atmospheric scattering on the clouds. These textures are present if the Background option selected in the States tab. A cube map for texturing the sky sphere with a static texture. The texture is 4-channelled (RGBA). A second cube map for texturing the sky sphere with a static texture. The texture is 4-channelled (RGBA). 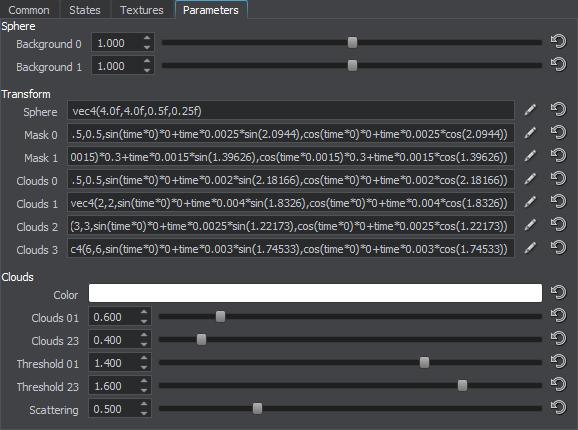 Textures transformation parameters are modified in the Transform section of the Parameters tab. The first two components scale the sphere by X and Y, respectively. They affect the circle of a horizon. The third component scales the sphere by Z, making the sky look higher or lower. The fourth component offsets the sphere vertically. Positive values move the sphere down, negative values move it up. This can be used to remove cloud artefacts near the horizon. Transformation of the mask texture mask_0. Transformation of the mask texture mask_1. First transformation of the cloud texture clouds_01. Second transformation of the cloud texture clouds_01. First transformation of the cloud texture clouds_23. Second transformation of the cloud texture clouds_23. Clouds parameters control the appearance of textured sphere clouds. They are modified in the Clouds section of the Parameters tab. Color of the clouds (applied for both clouds layers). Decreasing the value results in cloud color fading. Increasing the value results in cloud color intensification. Decreasing the value determines a weakened attenuation by the mask and abundant clouds. Increasing the value determines an intensive attenuation by the mask and sparse clouds. Sphere parameters are modified in the Sphere section of the Parameters tab. Backgroud 0 and Background 1 parameters are present only if Background option is set to Single or Double mode respectively. Decreasing the value results in dark and unsaturated color. Increasing the value results in light and very saturated color. Color multiplier for the second background texture.